Have you been river cruising before, and are looking into taking a Viking river cruise? Or have you done lots of ocean cruising and are now considering a Viking river cruise? Are you looking for first-hand knowledge from someone who has sailed with Viking? 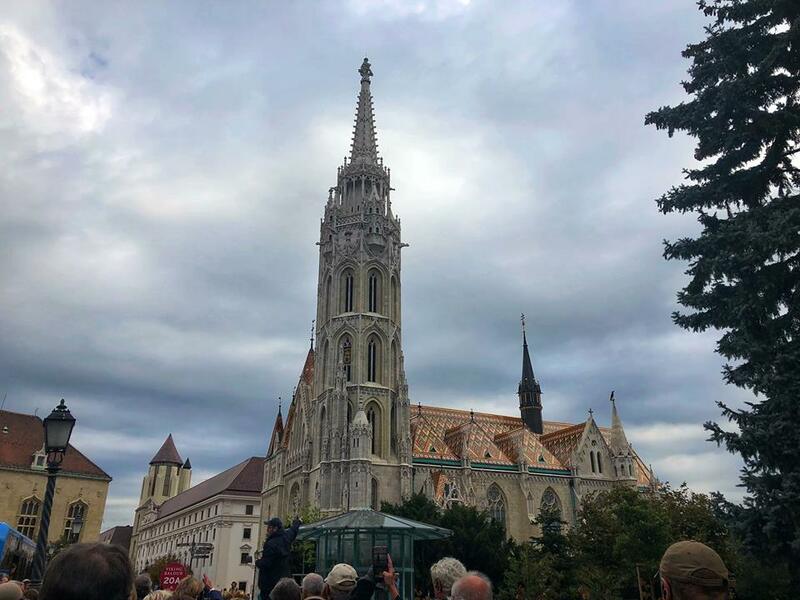 Look no more, because I sailed on Viking’s Grand European Tour 15 day river cruise and it was nothing short of spectacular. 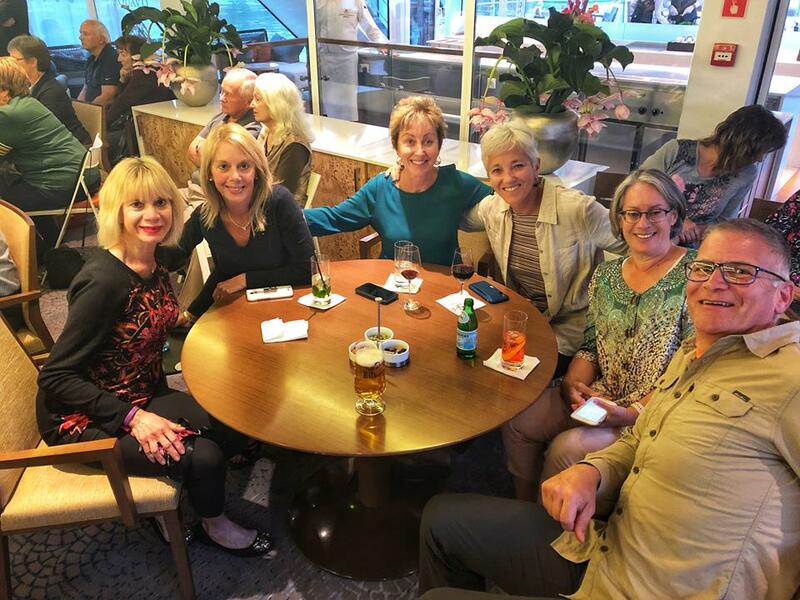 Here you will find my sister Robyne’s and my sailing experiences on week two of the Viking Grand European Tour river cruise. Yesterday found the guests of the Viking Baldur transferring to our new ship the Viking Magni which was located in Passau, Germany. Our ship was named after the Norse God Magni, who is the God of strength, believed to be stronger than his father Thor. We traveled three hours via Viking motor coaches, bypassing the shallow waters of the Regensburg, Germany area. 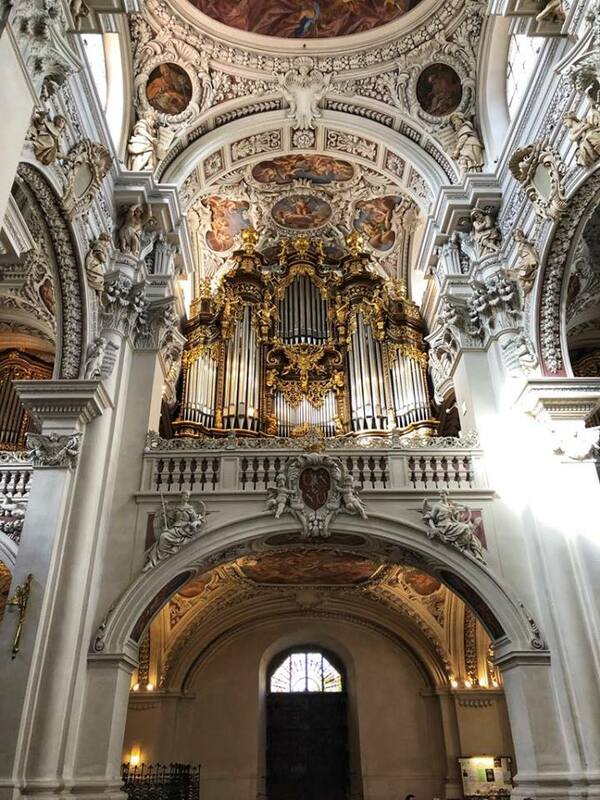 So today we had a decision to make: take the scheduled included shore excursion of Regensburg, a 98-mile coach ride away, or explore our new city Passau. We were grateful Viking still offered the Regensburg option, or that we could remain and visit Passau. Because I had a sore throat, I decided to stay in Passau and walk the city. Robyne elected to take the coach ride and visit Regensburg. Either way, we had met so many friends, we each were comfortable with our decisions for the day. 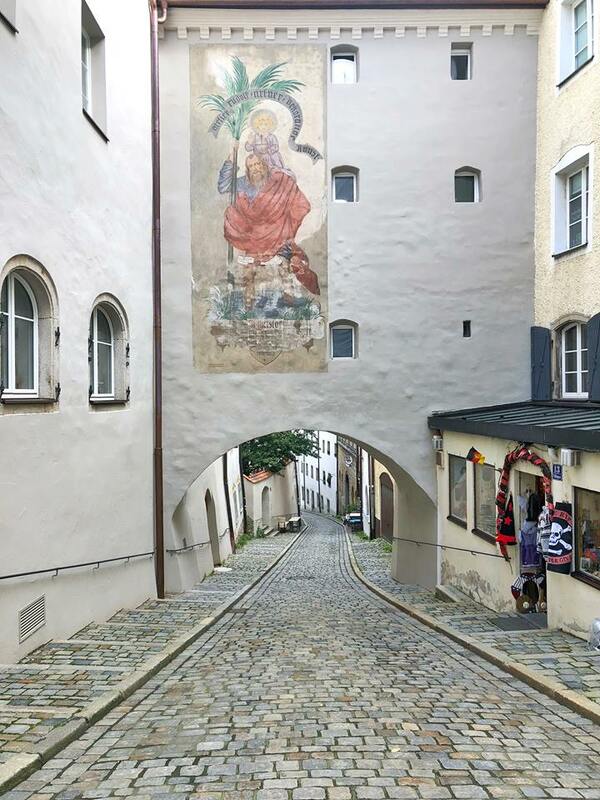 Lovely paintings and pastel buildings lined the cobblestoned streets of Passau. 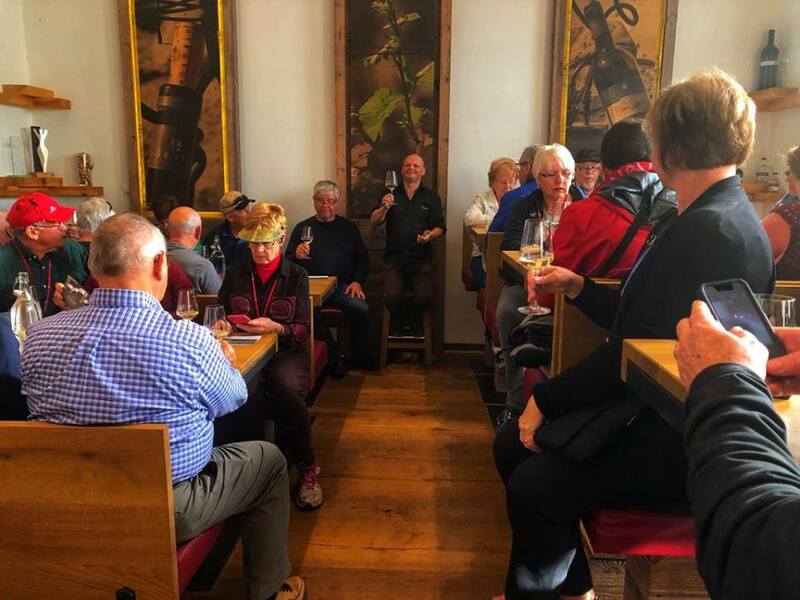 Guests also had the opportunity to take the optional excursion, (required additional fees) which was a full day excursion to Munich with the exciting opportunity to attend Octoberfest. And for our enrichment, an additional included tour was added to visit the large open-air Bavarian Village, but the capacity was limited. I was interested in this but waited too long and missed my opportunity. Worked out for the best I believe because I used the afternoon to rest instead. 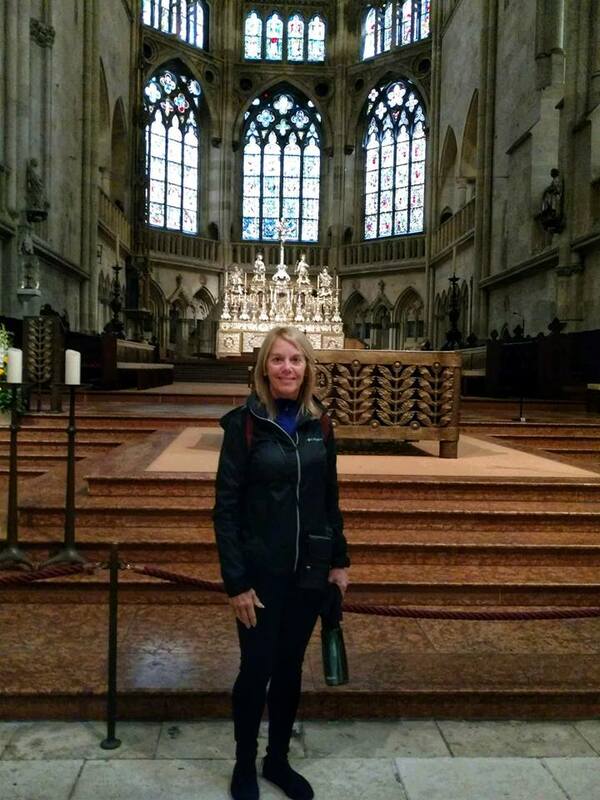 Robyne in front of the high altar of the Gothic St. Peter’s Cathedral in Regensburg Germany, during the Viking tour she chose to do during our Viking Grand European Tour. After breakfast, I headed out my friends Fran and Dan to tour Passau on foot. It was such a pretty city, and we had no particular plan but to see what crossed our paths. Passau is built at the confluence of three major European rivers and thus is exposed to major flooding. We noticed everywhere we walked signs marking high water levels of past floods. Remembrances of past floods are everywhere in Passau. The city center was very beautiful with the fabulous Baroque St. Stephen’s Cathedral. We shopped a bit and before we knew it, it was time for lunch. We all decided to head back to the Magni for a delicious lunch on board. Afterward, I rested in my stateroom all afternoon. 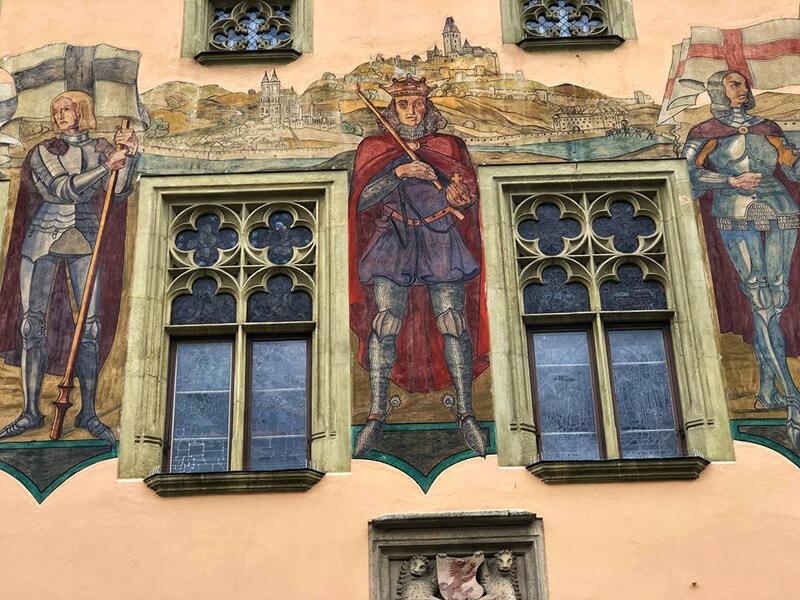 Bright and bold painting on the walls of Passau’s city hall. Viking also arranged a shuttle bus to take guests to the city center and back throughout the day, beginning at 9:00 AM and concluding at 6:00 PM. After all the tours had returned to the Magni, we met for the cocktail hour and Tessa’s port talk. In the lounge during cocktail hour with our great friends Sheri, Kathi, Fran, and Dan. After dinner in the lounge for our entertainment, there was an operetta of sorts. A few local singer/musicians from Nuremberg and Regensburg highlighted some of the greatest and most recognizable music of famous European composers, including Mozart. Local singers performing an operetta in the lounge after dinner. This morning Robyne and I were doing the included shore excursion: Passau Walking Tour. We were to meet our guide at 9:00 AM, so we had a leisurely morning. The Magni was docked literally on the edge of Passau, not far from the city center at all. 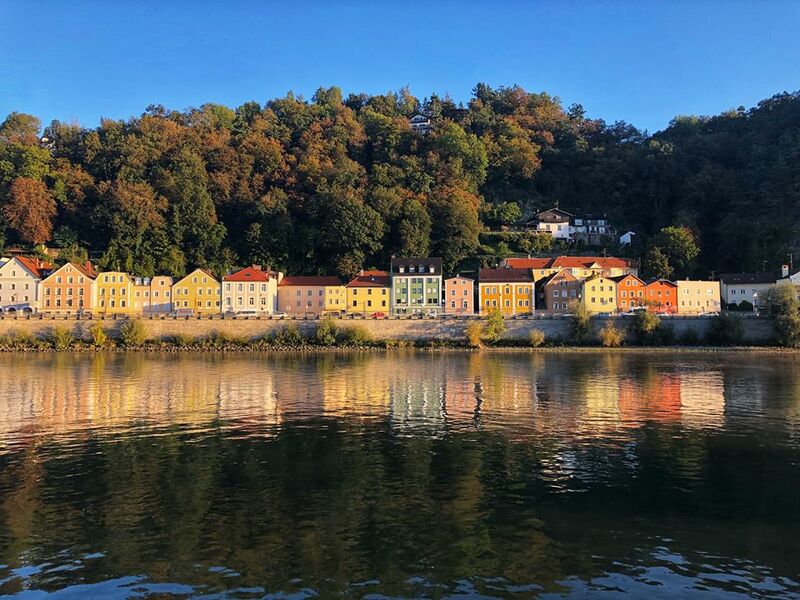 Can’t you just imagine waking up to this unbelievable sight in Passau during your Viking Grand European Tour river cruise!? Others were taking an optional tour to Salzburg (remember The Sound of Music??) and a fortunate few were taking the optional shore excursion to visit the Neuschwanstein Castle. It is the romantic castle perched high up on a hill in the Alps which inspired Walt Disney when he was designing Cinderella’s Castle. We met our guide outside the ship and learned the history of Passau located where the Ilz, Danube and Inn Rivers join one another. No wonder Passau is called the City of Three Rivers! The ornate Baroque inspired Old Town is situated on a spit of land between the Inn and the Danube Rivers. 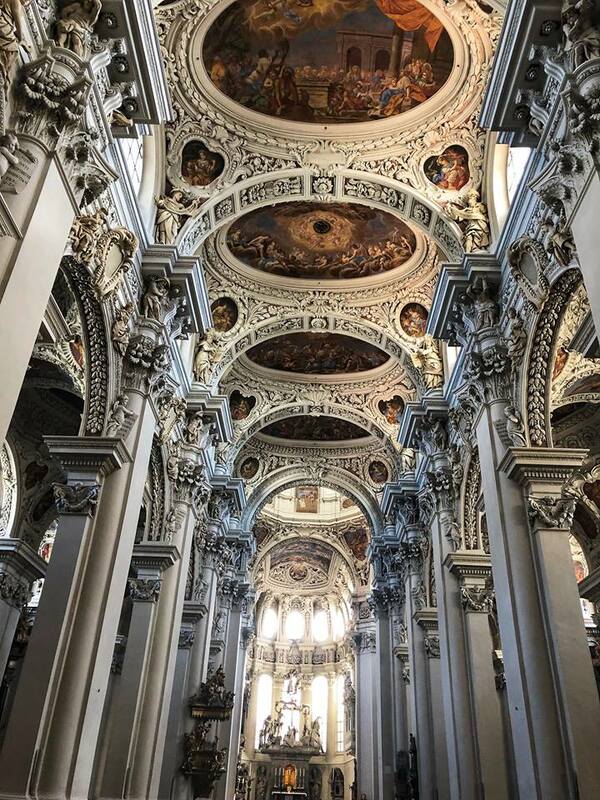 The indescribably magnificent Baroque ceiling of St. Stephen’s Cathedral in Passau. St Stephen’s Cathedral is one of the city’s most notable landmarks and boasts the largest pipe organ outside the USA. As part of our tour, we were fortunate enough to attend a concert to hear the unbelievable organ. The acoustics of the interior of the cathedral were fabulous. The stunning St Stephen’s Cathedral was built in the opulent and elaborately ornate Baroque style. Everywhere you looked your eye caught some magnificent statue or ornate painting. The cathedral is located at the highest point of the old town. The gleaming silver pipes of St Stephen’s organ. After the concert, we walked back to the ship for lunch. Because we had no organized plans for the afternoon, Robyne and I set out again to explore Passau. We wandered through the pastel-colored streets from the Danube through town to the Inn River. We decided to hike up the hill to do a personal pilgrimage at Mariahilf situated on top. It was a great physical and spiritual afternoon for us. Equally impressive but on a much smaller scale, the high altar of Mariahilf, on our personal pilgrimage. The Viking Magni set sail at 6:00 PM and we reluctantly said goodbye to Passau and to Germany because we were headed to Austria next. 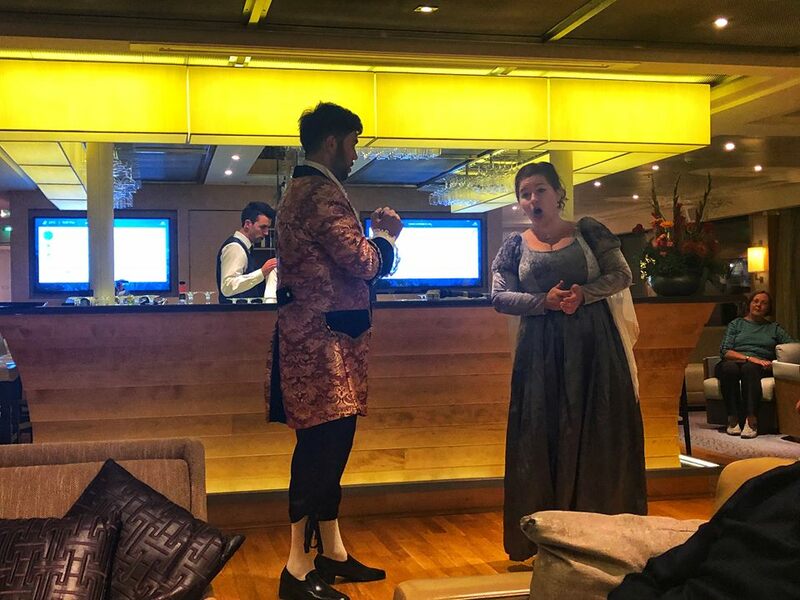 After port talk and dinner, Tessa hosted a presentation in the lounge about Vienna coffeehouses and the delicacies they would offer to tempt us, and also on Wolfgang Amadeus Mozart. The busy day concluded with dancing in the lounge for those who still had energy! Good evening from the beautiful foyer of the Magni during our Viking Grand European Tour. I personally was saddened to leave Passau because (although I loved all the cities we visited) Passau ranked very high on the top of my favorites list. That was until we arrived at Melk, Austria. Little did I realize the day in store for us! 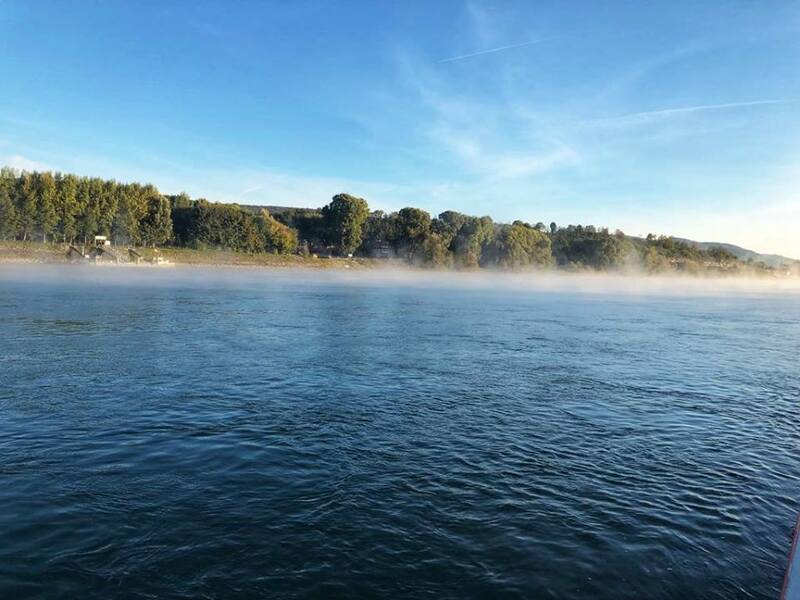 It was 36* F when we woke up to this lovely view of the misty Danube in Melk, Austria. By this time in our Viking Grand European Tour, Robyne and I made great use of our stateroom refrigerator, stocking it with fruit, snacks, peanut butter and bread. We often had breakfast in our stateroom, which allowed us to leisurely lounge around longer before we started our busy days. 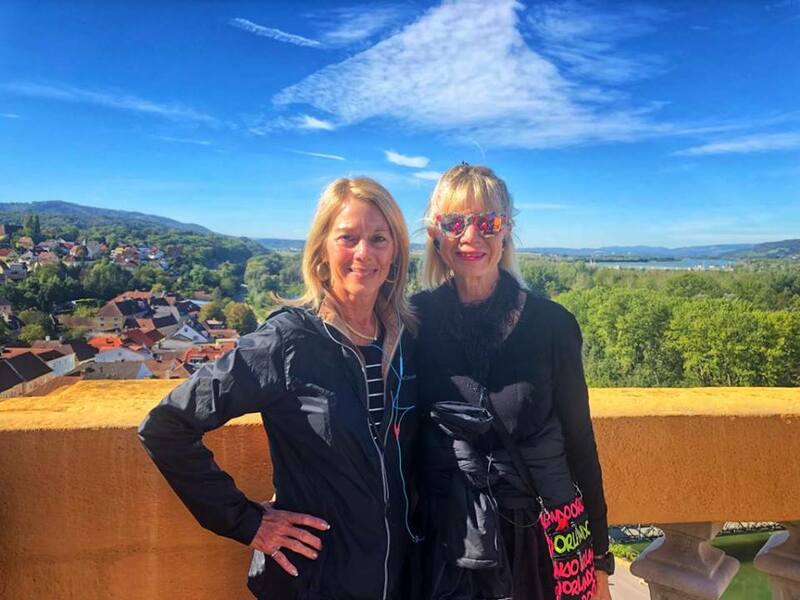 On the balcony of the iconic Melk Abbey above the city during our visit to Melk, Austria on our Viking Grand European Tour. Scheduled this morning was a tour of the most famous abbey in Austria, Melk Abbey. We were on our motorcoach by 9:35 AM and rode up the hill to the abbey. We met our guide at the entrance who immediately explained the history and architecture of Melk Abbey. Once we entered the abbey, there was no photography permitted. The surveillance cameras were everywhere and volunteers monitored visitors in each room. 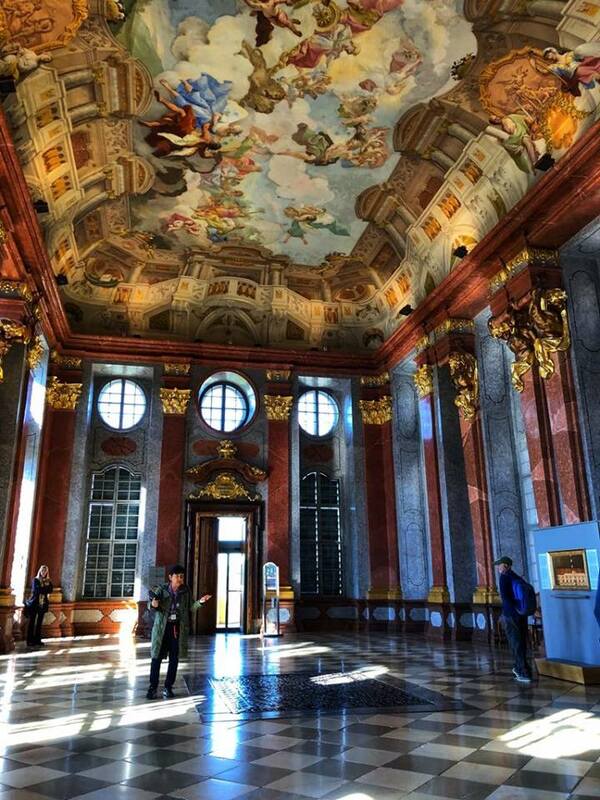 The Grand Room of Melk Abbey. NO photography after this. Strictly enforced! Melk Abbey was originally a royal palace and our tour took us through rooms used in the past by royalty as their apartments, grand halls, and even a library. In the 1200s the palace was turned over to the monks who turned it into a fortification. The church was simply the MOST BEAUTIFUL GORGEOUS church I have ever visited in my life. The kaleidoscope of colors, the stunning gold carved pulpit, and the jaw-dropping extravaganza of Baroque architecture defies description! The 900-year-old abbey is still run by Benedictine monks today and there is a monastery school with 700 students as well. 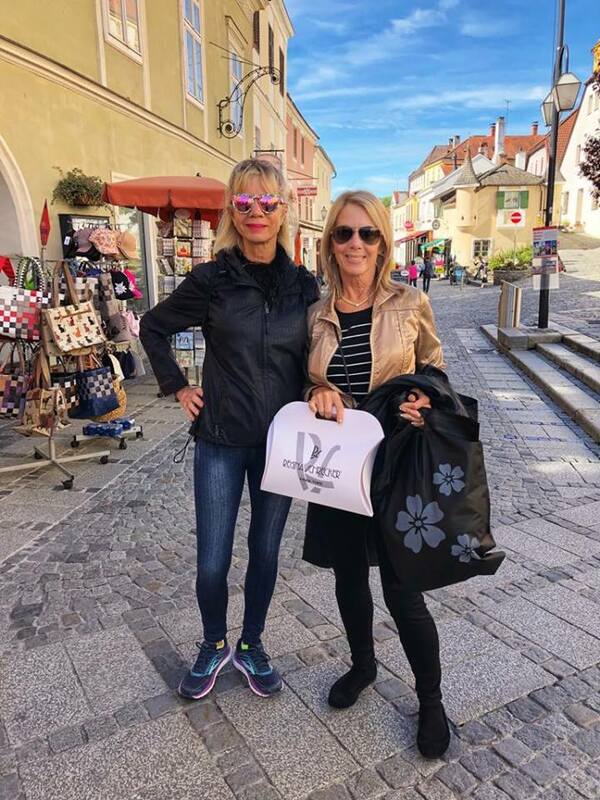 After touring the gift shop and purchasing some souvenirs, we decided to walk back to the Magni with our friends Fran and Dan, through the very charming and lovely city of Melk. We did some shopping, and then some more shopping. And soon it was time to head back to the boat for lunch. Shopping in the delightful Austrian village of Melk. One of us was very lucky, yes?! The Magni was sailing at 1:30 PM through the Wachau Valley on our way to Krems. 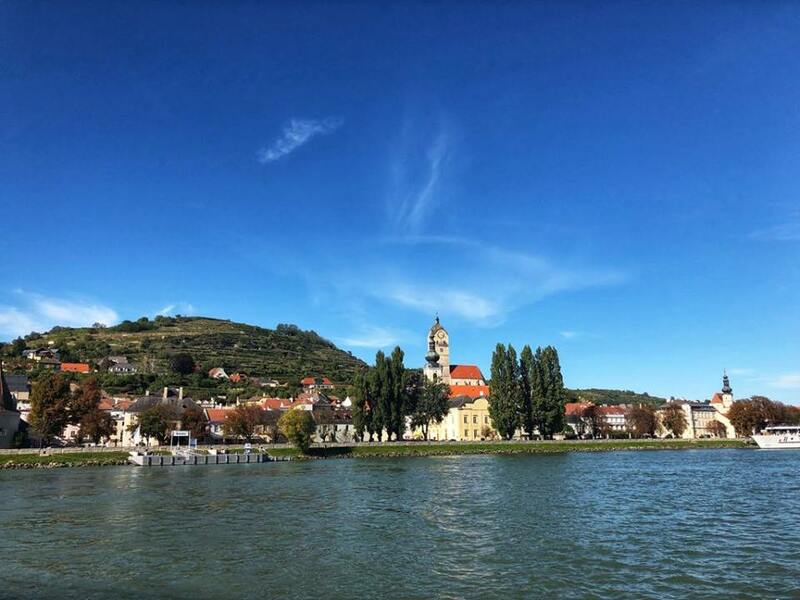 The Wachau Valley of Austria is considered the most scenic stretch of the Danube River. Eighteen miles of it are designated as a UNESCO World Heritage Site. Here we are toasting Prost! during lunch in the Aquavit Terrace, before drinking the German herbal liqueur Jagermeister. We were informed of this approach to care for my cough/cold from the Viking bar staff. Thank you so much! Tessa, our program director, began narrating as we sailed through this enchanting area at 1:45 PM. We passed steep hillsides where vineyards thrived and the grapes needed to be harvested by hand, countless charming towns and numerous castles and castle ruins. Lovely Austrian countryside in the Wachau Valley on our Viking Grand European Tour. In the lounge, later on in the afternoon, there was an apple strudel workshop, where guests were taught how to assemble an authentic Austrian apple strudel. And Austrian tea time with delicious delicacies was also offered in the lounge after that. There was hardly never a time when Viking did not offer some enriching event for us. We were free to attend, or not. It was really nice to have such options though to choose from during our Viking Grand European Tour. At 4:00 PM The Viking Magni arrived in Krems, Austria, for the rest of the afternoon. 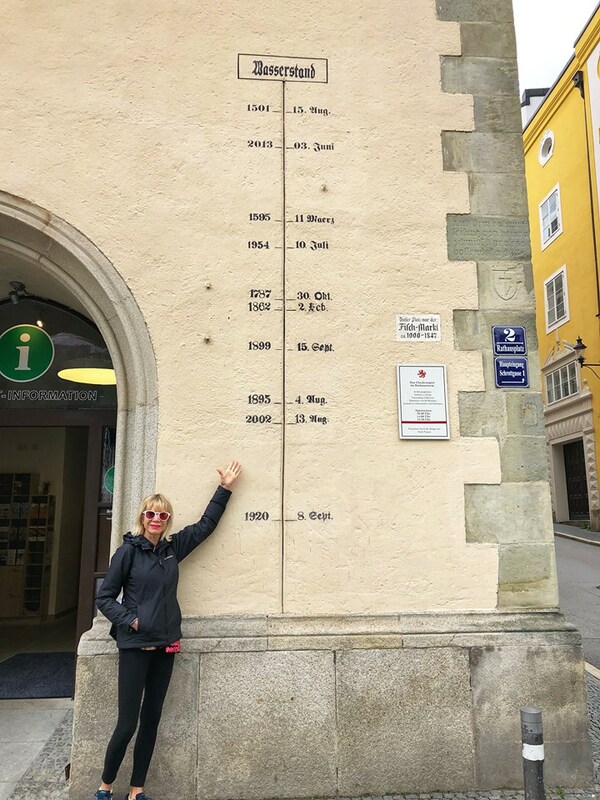 We did not have the opportunity to explore Krems because Robyne and I elected to sign up for an optional tour: Wachau Valley Winery. Now I am not a wine drinker at all, but this specific tour intrigued me. How delicious must the wine be whose grapes are cultivated in the rich soils of this UNESCO designated World Heritage Site! In the wine sampling room with the vintner and winery owner Erhard Morwald. 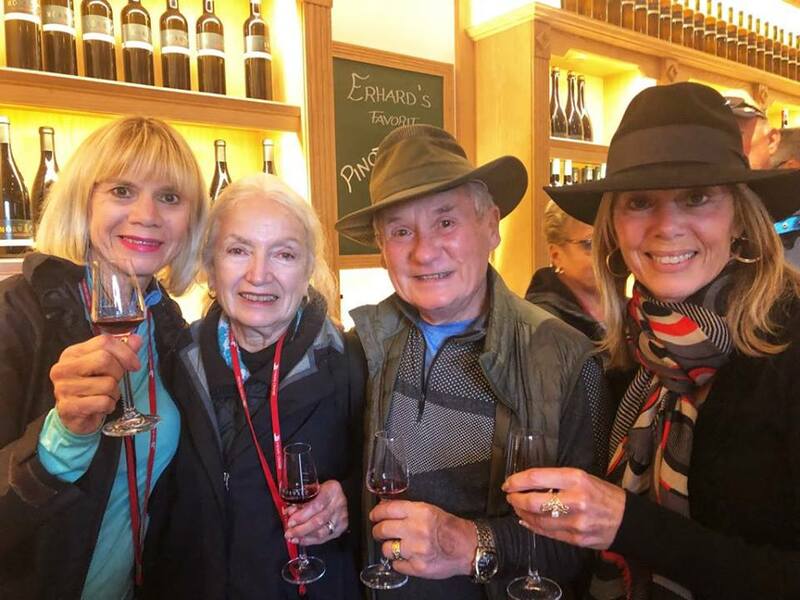 We were on our motorcoach by 4:15 PM and because our local tour guide, Trinka, who accompanied us to the winery was so funny, we knew it was going to be a great afternoon. The ride to the winery was only 30 minutes or so, and before we realized it, we were there. As soon as we arrived we were greeted by the winery owner, Erhard Morwald. He was very personable, spoke with limited English, but between our guide and him, we understood everything. Collectively they were so funny and the tour flew by. Touring the winery and seeing all of the awards his vineyards have won and are still winning, was amazing. It was here we learned that the Morwald Vineyards produce over 350,000 bottles of red and white house wines for the Viking Cruise Lines each year, and have done so since the 1990s. Showing Mr. Morwald our appreciation! Next, the wine sampling! The wine sampling room was bright and spacious. There were several servers who poured while the vintner explained each pour and how he favored them. We sampled three whites and three reds. Generous samplings, I might add. And then, the apricot Schnapps also made at the winery, appeared. Oh boy, we were having a good time! I can honestly say though, I am not a fan of Schnapps. The walnut bread served alongside the wines was a delicacy in itself. Alas, the afternoon passed by too quickly and it was time to head back to the Magni. Well, that was, after we looked in the gift shop! Trinka, our guide, was pouring yet another delicacy, red wine liqueur. It was very delicious and I purchased a bottle to bring back home with me. I’m sorry to say I think I made a mistake by not buying more! Here we are in the Morwald Winery gift shop sampling their red wine liqueur with our friends Charlie and Rose Marie. You can only imagine what a fun bus ride we had heading through the Wachau Valley in Austria at dusk. The sky was alive with color. We were late returning and missed the port call, but were right on time for dinner. 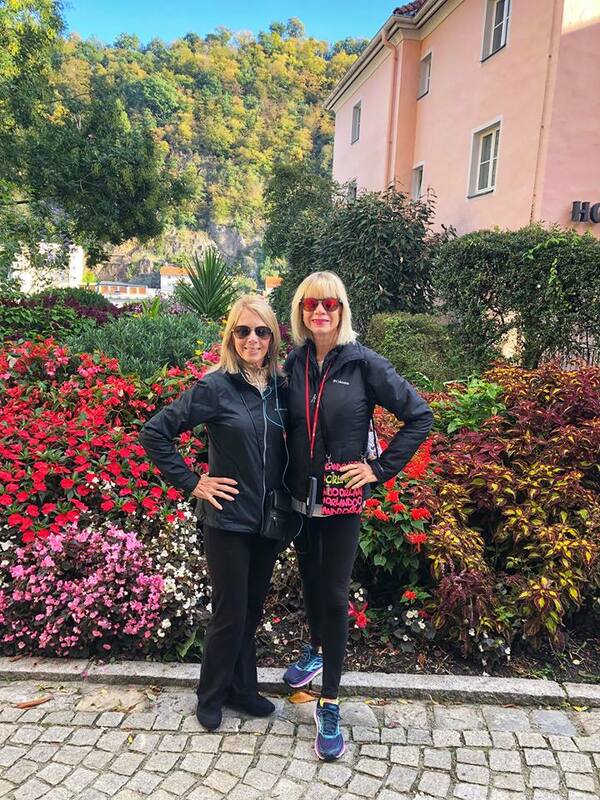 I can speak for Robyne and myself in saying the trip to the Morwald Winery in the Wachau Valley was our favorite optional excursion of all during our Viking Grand European Tour, and we both highly recommend it. Highly. You do not have to be a wine drinker to thoroughly enjoy this experience. I do not drink wine at all and I simply loved it! 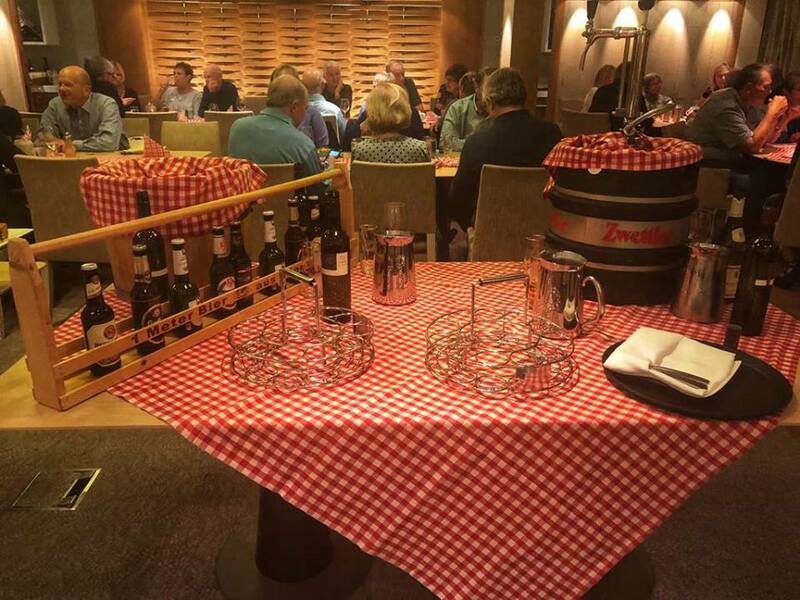 The Magni dining room was very festive to celebrate our Taste of Austria! To celebrate our arrival into Austria, the staff of the Magni held a special dinner for us: Taste of Austria. It was an Austrian buffet, with local dishes, the staff all dressed in local Austrian costumes, and there was a father/son team of strolling musicians playing their accordions, serenading everyone. It was very festive and very much fun! Our team in the Magni lounge, ready for the music trivia game. To top off the evening of a very busy and very remarkable day, Tessa conducted another fun game in the lounge, a music quiz. Thank you, Viking for one of the most amazing days we have ever had on our Viking Grand European Tour! 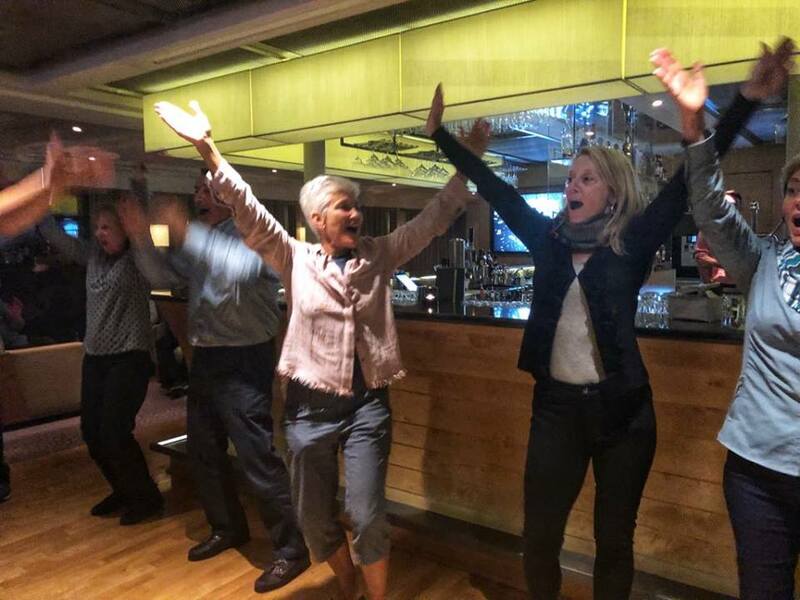 Up and on their feet dancing during the music trivia game in the lounge to end another fantastic day on our Viking Grand European Tour river cruise. Bonus points if you guess what song they are dancing to! The Viking Magni set sail at 9:55 PM heading to Vienna. 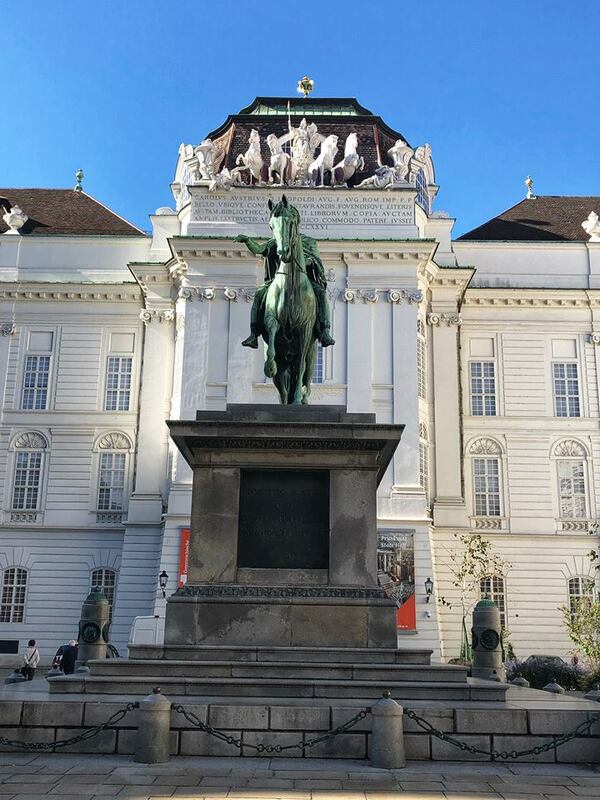 Today in Vienna, our included excursion departed the Magni at 9:15 AM. We were docked several miles from the city center, so we rode the Viking motorcoaches into town. 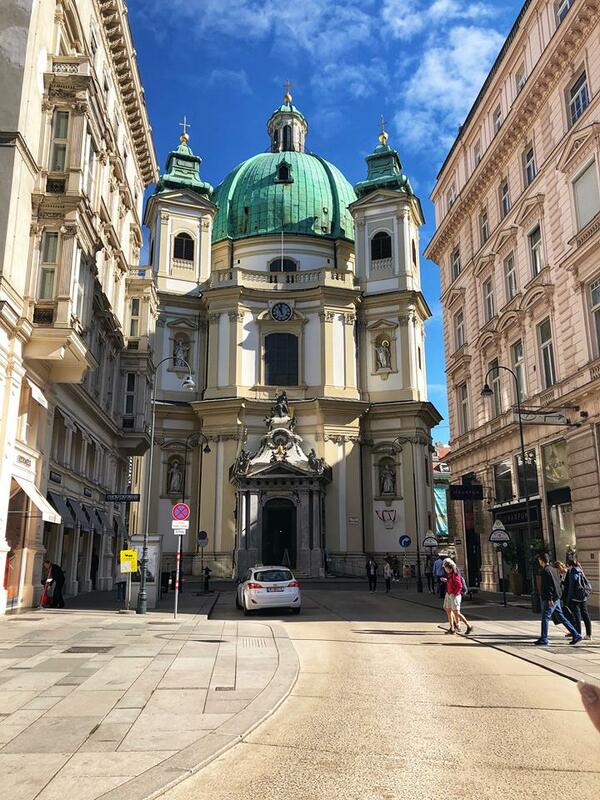 Our local guide pointed out all the different styles of gorgeous architecture as we rode along the Ringstrasse, the wide boulevard that encircles the inner city. Our motorcoaches during the Viking Grand European Tour were always first-class, like this one ready to transport us to Vienna. Vienna is the capital of Austria and displays a more elegant and romantic vibe. Also known as the City of Waltzes, Vienna is Europe’s center of classical music. 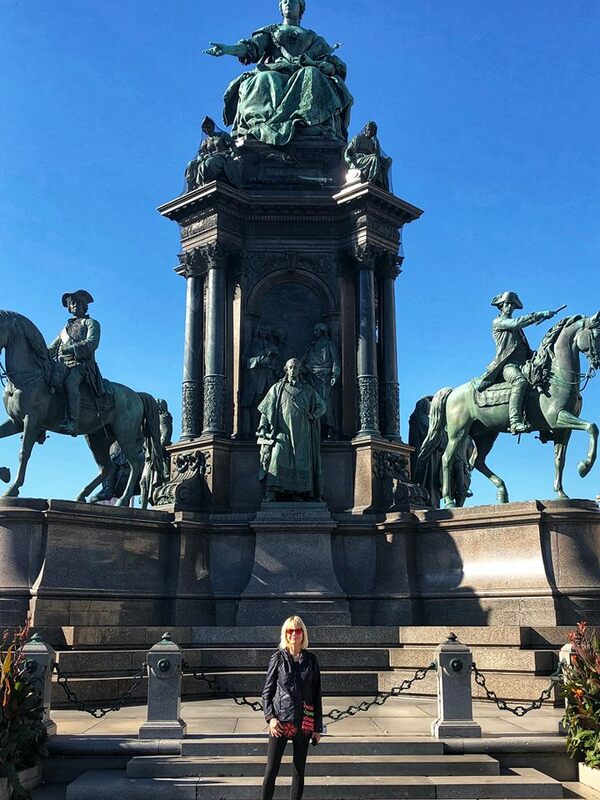 Ornate statues and fountains like this one abound in Vienna. It was an hour-long ride to the city center, winding our way past palaces and public buildings so ornate they could have been palaces, as our guide pointed out the highlights. Finally, we reached the city center of Vienna. Talk about world-class shopping! Think of a store, Vienna has it. Vienna City Center with a wealth of shopping to please every budget. And restaurants galore. One of the most difficult things to decide was where to stop for coffee and Sachertorte. Coffee in Vienna is a cultural pastime and there are quaint Viennese coffee houses everywhere. Sachertorte is a rich decadent iced chocolate cake served with unsweetened whipped cream. Opulent buildings such as these were around every corner on every street in Vienna! With our guide narrating, we walked by the Spanish Riding School stables where we got a quick glance of the Lipizzaner stallions. They were beautiful animals. In the middle of the town square was the Gothic-inspired St. Stephan’s Cathedral. 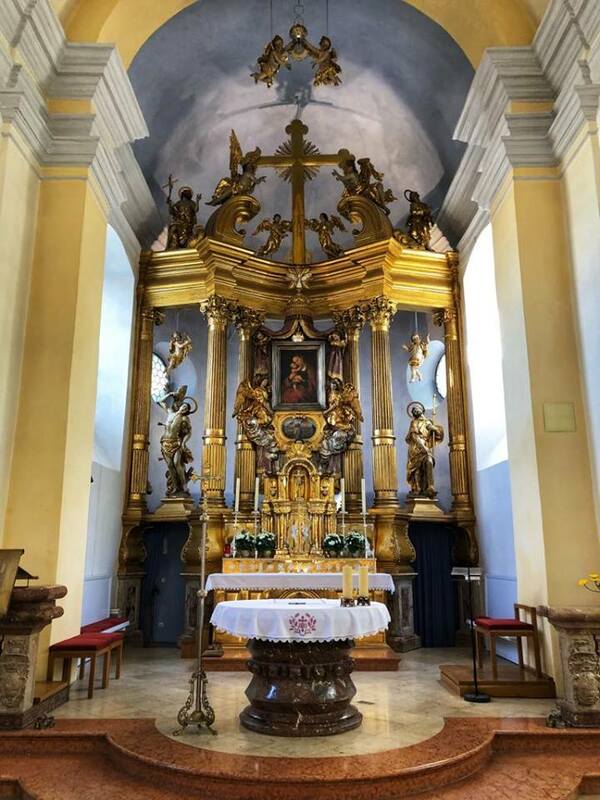 I was very disappointed that walking through the church was prohibited the day we visited and locals were stationed throughout the rear of the church explaining that. The Gothic architecture on the walls and ceiling was certainly evident though. 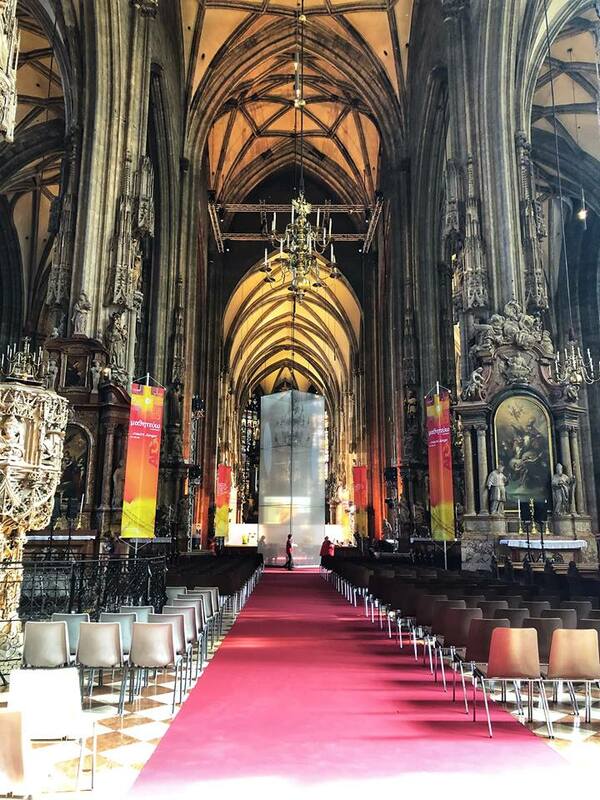 Beautiful Gothic St. Stephan’s Cathedral in Vienna City Center. I was so disappointed we could not walk around more to admire it. After our guided coach and walking tour of Vienne concluded, we decided to walk back to the Magni, with our friends Fran and Dan. We used the GPS on Dan’s phone because Vienna was a huge city and we didn’t want to get lost. Turns out we were really only 2 miles from the ship. After lunch, Robyne and I decided to head back into the city for some shopping. Our friends accompanied us and gave us a quick lesson on using the train. I’m quite overwhelmed when it comes to the subway or trains in other countries, but this time since we only had two stops to go each time, it was easy. We shopped the day away and barely made it back to the boat for dinner! A good portion of the Viking Magni guests accompanying us on the Viking Grand European Tour were attending the optional excursion: Classical Concert. The music of Mozart and Strauss was to be played. We decided not to do this excursion, but 100% of everyone we spoke to upon their return simply gushed about how lovely it was in such an opulent setting. On behalf of all of them, I would recommend this optional tour on your Viking Grand European Tour river cruise. Since those guests participating in the classical concert had a 5:30 PM early dinner seating, the Magni offered a late night snack for them of goulash at 10:30 PM upon their return. 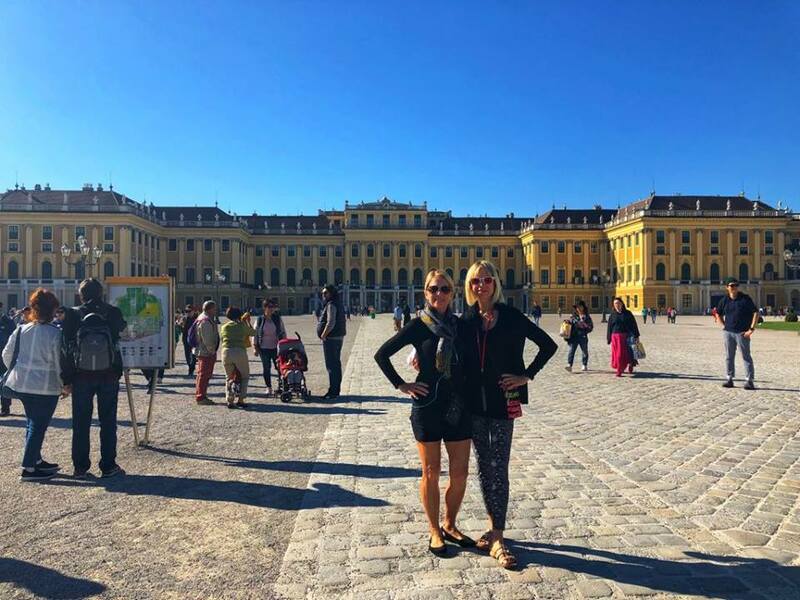 On a busy morning, we were eager to see the Hapsburg vacation palace. Upon arrival we were surprised at the palace’s size– it was remarkably large! Matter of fact, it was built to rival the expansive Versailles Palace located outside Paris. Again, once inside we were not permitted to take pictures of the sheer opulence. It was indescribable. We toured room after room of sumptuous decadence and it was all beyond beautiful. After the tour, we were encouraged to stroll through the expansive gardens. it was such a lovely sunny afternoon and we took advantage of it. 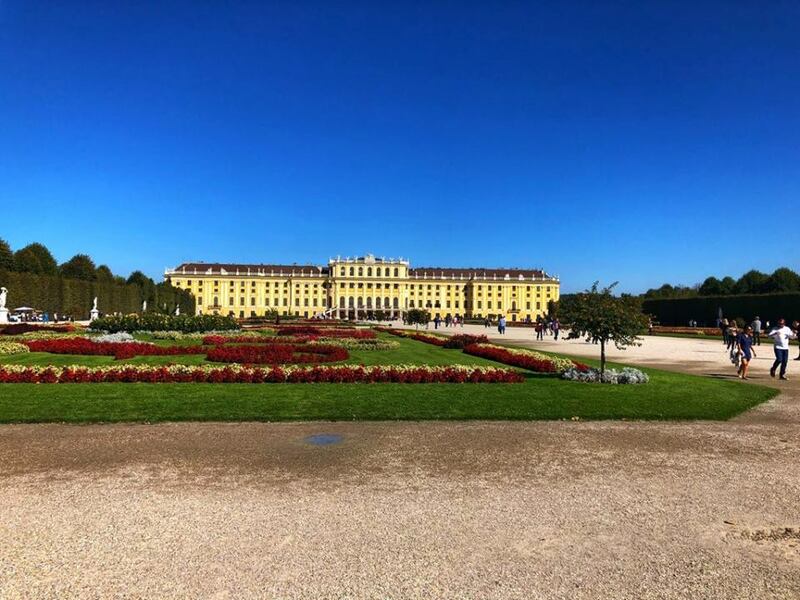 It was a beautiful day for a stroll through the Schonbrunn Palace Gardens. We were back at the Viking Magni in time for a delicious lunch. We had our afternoon free until the Magni cast off at 4:00 PM so Robyne and I headed back out because we heard there was an Octoberfest celebration nearby. Our destination was very easy for us to get to, no phone GPS needed, because we simply headed to the huge Ferris wheel in the distance, the Weiner Riesenrad. The Prater amusement park was less than 2 miles from where our ship was docked and very crowded on that Friday afternoon. It was not difficult to locate the Octoberfest celebrations once we arrived, we simply headed to the singing and laughing and music! 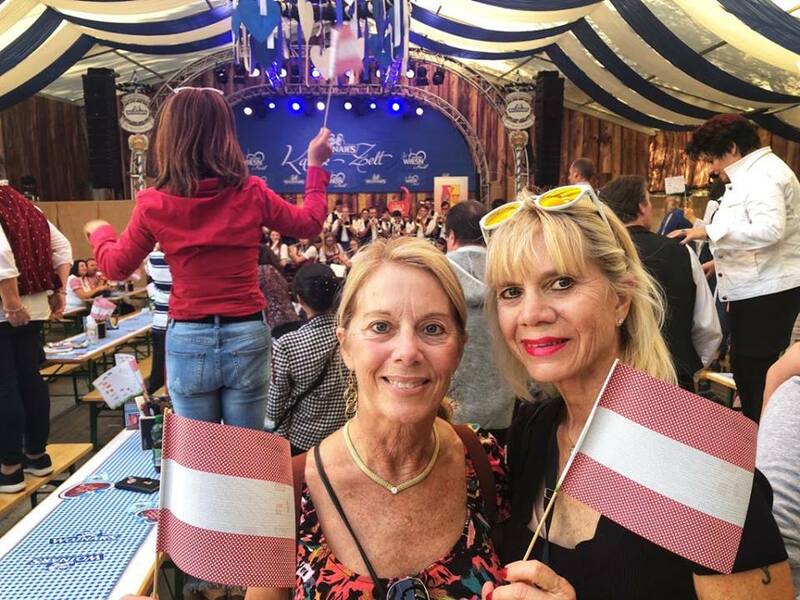 Robyne and I had so much fun at Octoberfest in Vienna during our Viking Grand European Tour. All too fast 3:00 PM arrived and we headed back to the Magni. 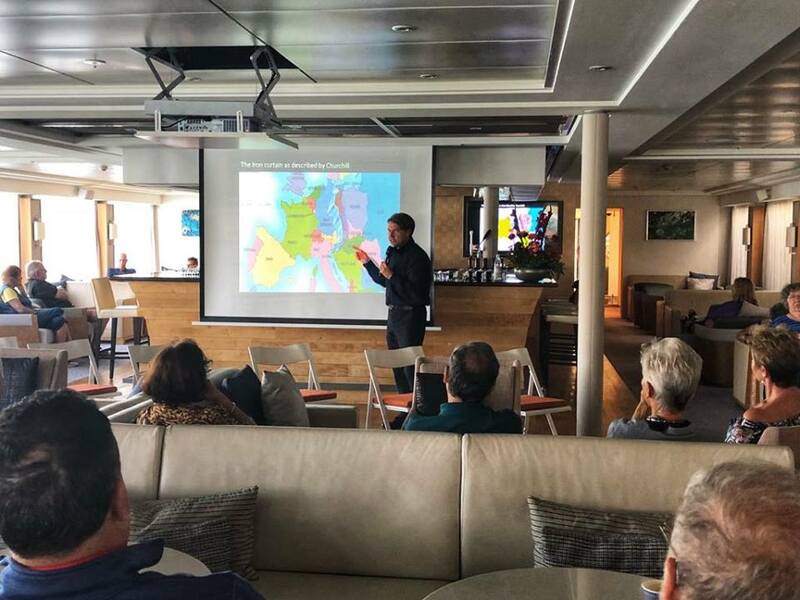 An enrichment lecture entitled Austrian History was being presented onboard in the lounge by a professor from the local Austrian University. What could have been a dry or uninspiring lecture actually turned out to be very interesting and entertaining. As with all Viking presentations, this one was no different: the speaker had great command of the subject matter and presented it in an engaging manner. I would recommend when on your Viking Grand European Tour you attend this presentation. Very interesting presentation in the Magni lounge on Austrian history. We made a point to attend as many of the enrichment activities as we could. At 4:00 PM the Viking Magni set sail for Budapest, Hungary. 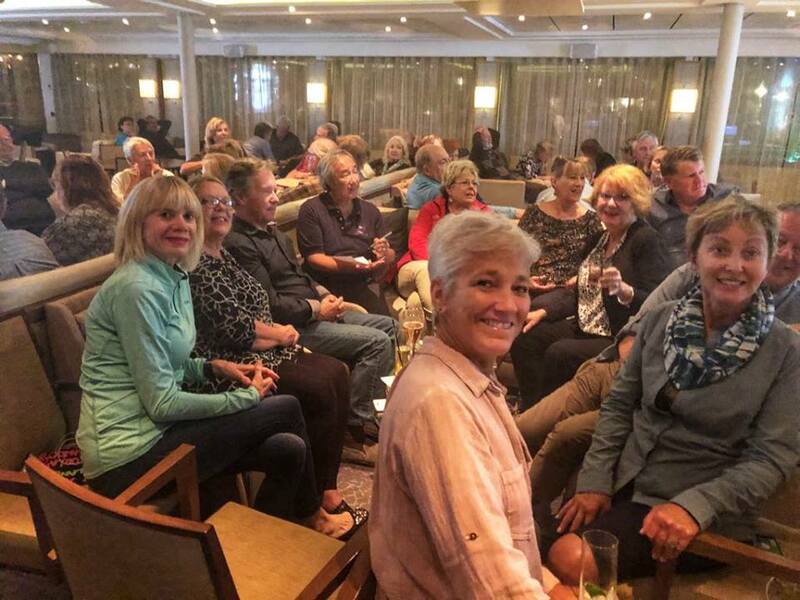 We spent many afternoons out on the top deck during our Viking Grand European Tour cruise, and it was a very popular way to meet other guests. Here we are as the Magni departed Vienna. 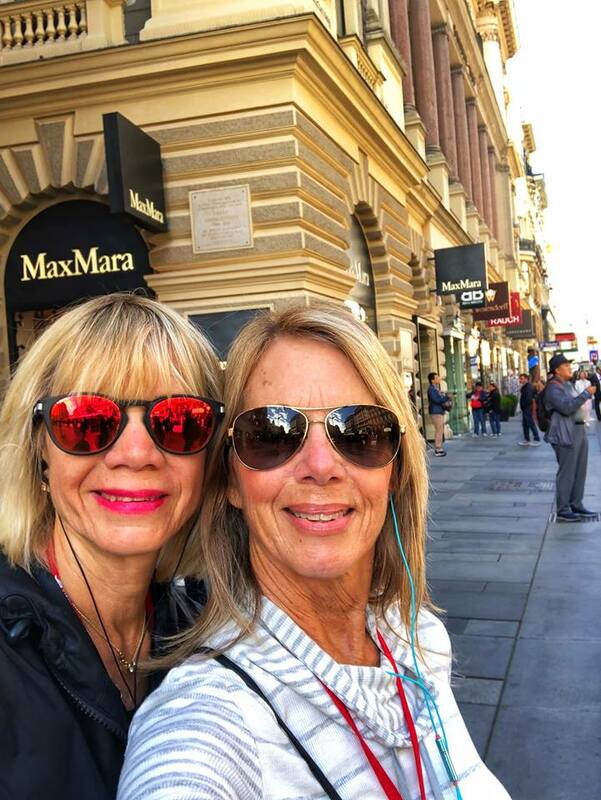 As much as we did not want to think about it, our Viking Grand European Tour river cruise of a lifetime was coming to an end. At her port talk this evening, not only did we learn about Budapest excursions, but Tessa began sharing the disembarkation process with us. It was an overview of what was involved, and the next evening, she would handle specifics. Here our program director, Tessa, was instructing us on the disembarkation process. Our busy evening ended with dinner and dancing to Oldies but Goodies in the lounge. And yes, they did take requests! 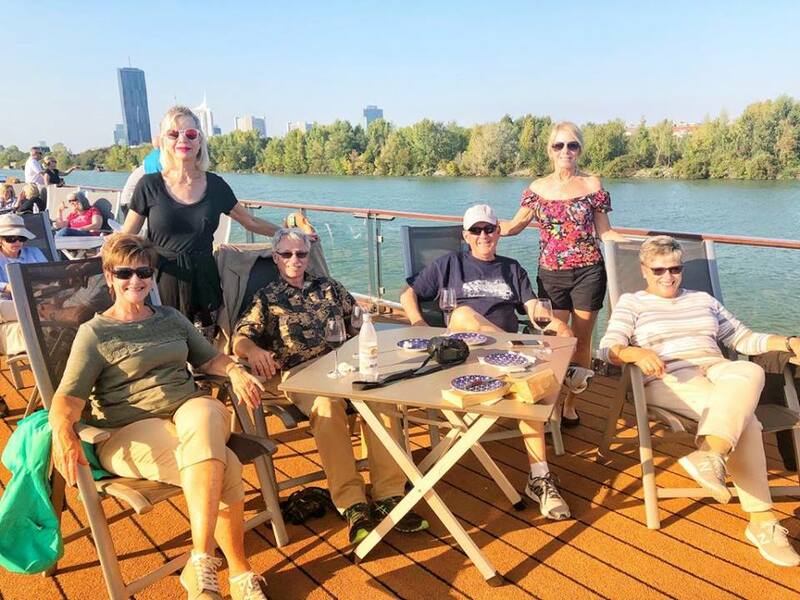 We met several of our neighbors when we were all out on our balconies during our Viking Grand European Tour as the Magni passed through the locks on the Danube. 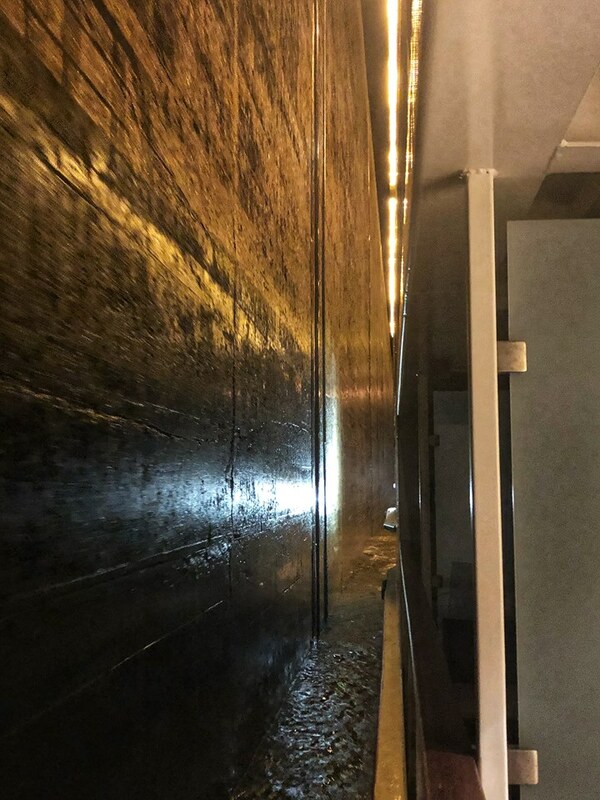 Here you can see from the wet walls all the way from the top to the bottom of this picture how far we were lowered before we could continue sailing. Budapest, the capital of Hungary, is definitely a visually beautiful city, indeed. 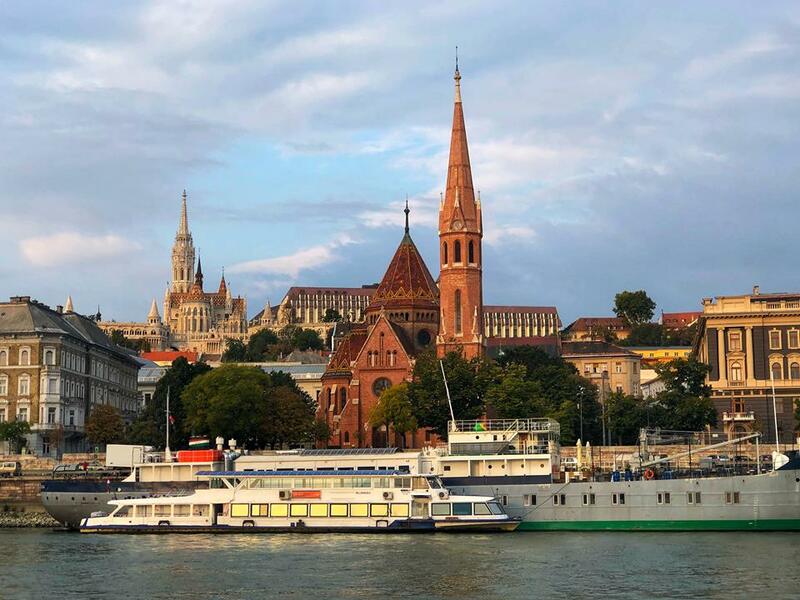 The Danube River cuts the city in half: the more cosmopolitan elegant Pest on one side and the more traditional Buda on the other. The Viking Magni was docked right near the iconic Chain Bridge, a very convenient location for exploring. This outstanding view was outside our stateroom balcony, looking up to Fishermen’s Bastion on the Buda side of the Danube River. We met our local guide at 9:00 AM for our included shore excursion: Panoramic Budapest. 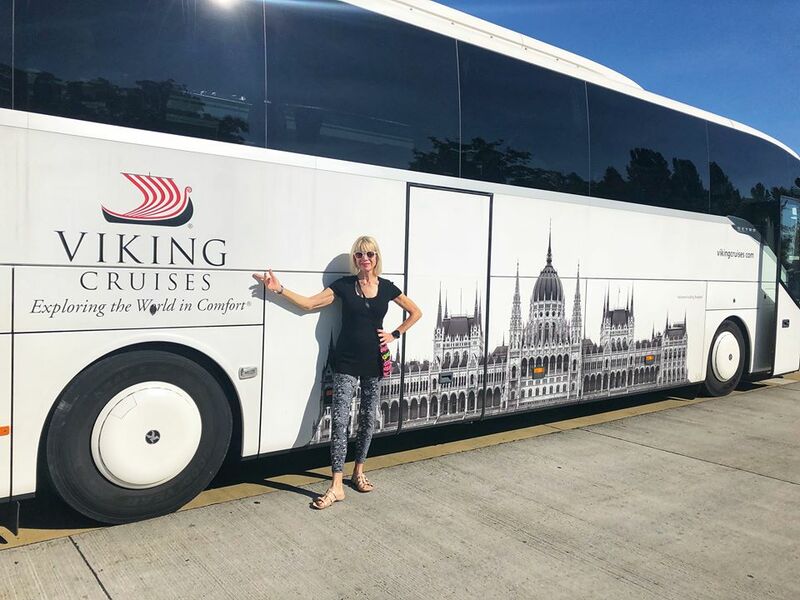 We boarded our Viking motorcoach right near the Magni and took a wonderful tour all through Budapest. We began in Buda, the hilly historical part of the city, with our guide narrating along the way. Our coach brought us partially up Fishermen’s Hill where we were let off and walked up to Fishermen’s Bastion. It was a very crowded Saturday morning, but we still were able to immerse ourselves in the Hungarian history around us. 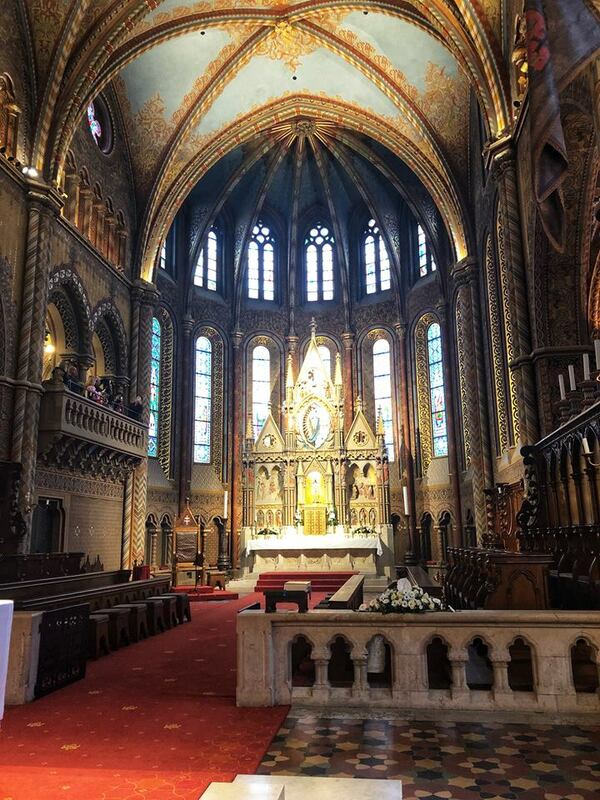 The grand and mighty Matthias Church stood tall in the Bastion with an inspiring story all its own. The panoramic vistas of the Danube and Pest from high up on Fishermen’s Bastion were unbelievable. Turkish influences were apparent everywhere inside Matthias Church. Here is the grand high altar. 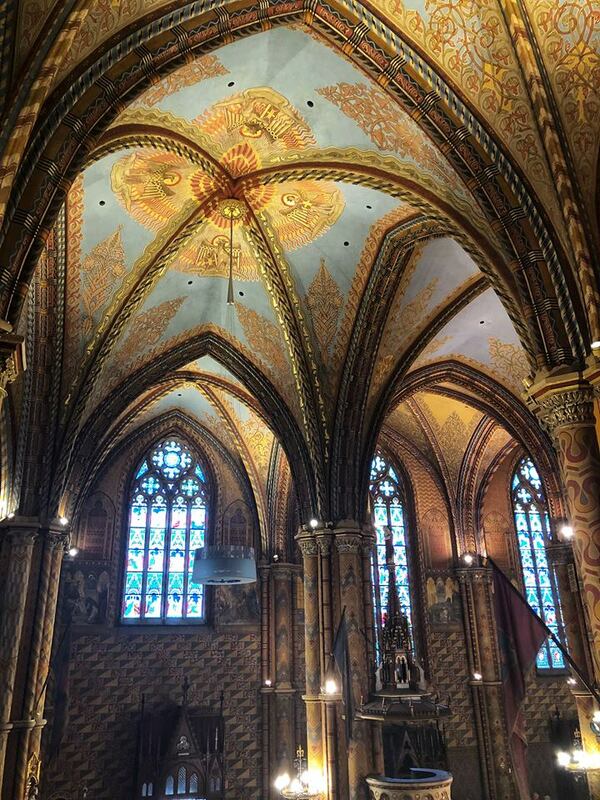 The opulent details of the past Turkish influence are visible everywhere in Matthias Church in Budapest. Soon it was time to walk back down Fishermen’s Hill to our Viking motorcoach. We continued our motorcoach tour on to the modern Pesh side of the city. 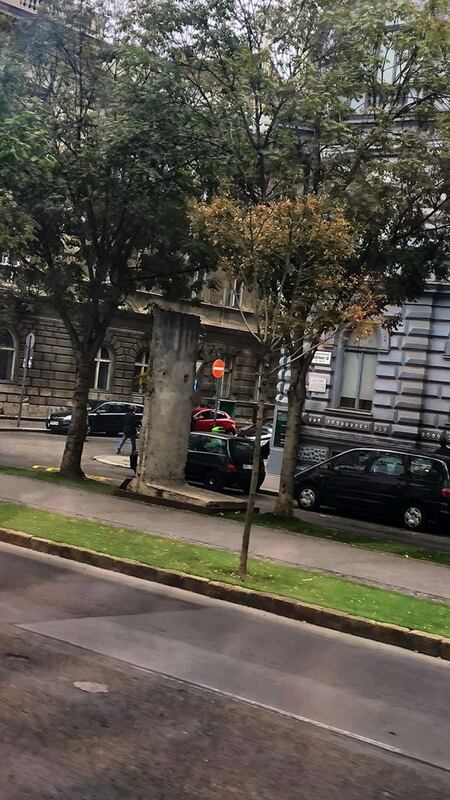 We saw Hero’s Square, and the National Opera House, a slab of the dreaded Berlin wall, and the Hungarian Parliament Building. A very grim reminder indeed of the Berlin Wall. 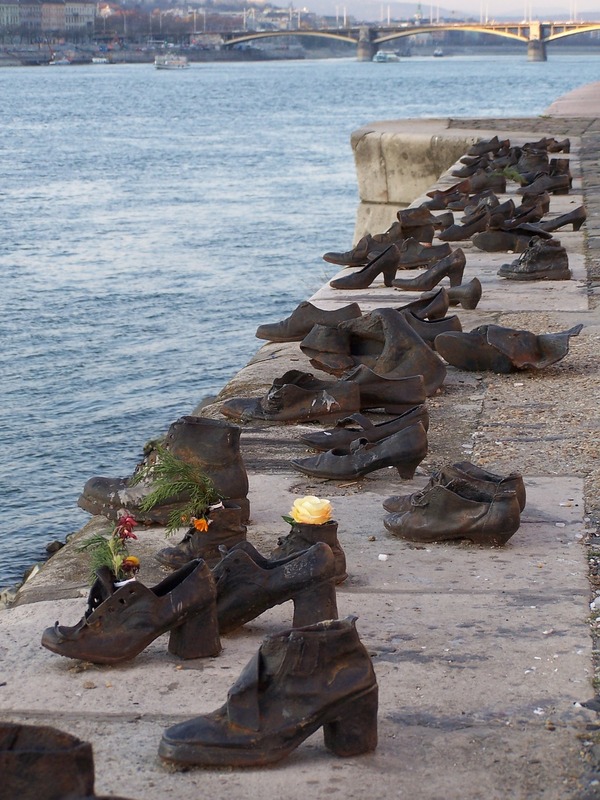 The most moving, the most emotional monument we encountered, in my opinion, was Shoes on the Danube. Commemorating when the Hungarian Nazis killed Jewish Hungarian citizens on the banks of the Danube River, then threw their bodies into the river, it is now a very popular location. There are always candles and flowers placed in and around the brass shoes. Although they deeply regret what happened, the Hungarian citizens are not sweeping it away as it is part of their history. We were back at the Viking Magni after a very wonderful and enlightening tour of Budapest for lunch. 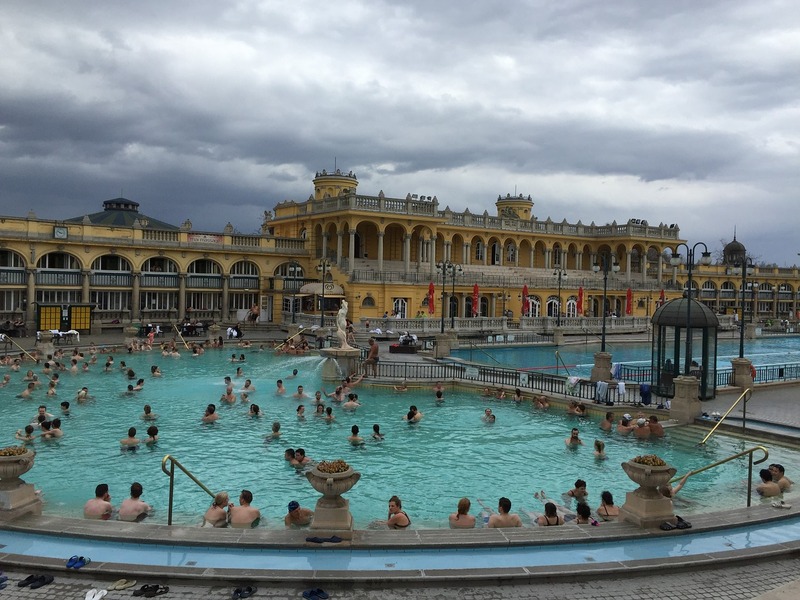 As one of the final things we would be participating in on our Viking Grand European Tour river cruise, Robyne and I chose the optional excursion: Budapest thermal baths. Relaxing in the rejuvenating waters of the Hungarian spas is a cultural tradition and has been a way of life for centuries. Our motorcoach picked us up at 2:00 PM and we drove to the Szechenyi Baths and Swimming Pool on the Pest side. The Viking Magni provided robes and slippers for us, and of course, we wore our bathing suits. (I brought a pair of flip flops too.) We found out that the Szechenyi Baths is one of the largest spa complexes in all of Europe. Many services were offered and I needed a map to get around. The Szechenyi Baths and Swimming Pool outdoor pools in Budapest on our Viking Grand European Tour. Yes, gets very crowded! Wherever water was located, there was a sign informing us of the temperature of the waters. My favorites were the steam chambers. I liked the saunas too but steam is my thing! I was grateful these rooms were designated as quiet zones because the spa was very crowded and very loud on a busy Saturday afternoon and I appreciated the few moments of peaceful quiet. Indoor pools. Outdoor pools. It was all quite overwhelming and wonderful at the same time. I recommend this optional tour on the Viking Grand European Tour to get a first-hand look at Hungarian culture up close, but be warned, it can be very crowded, and you could be in waters with lots of peoples. And it can be loud! All too soon our afternoon of soaking in the nourishing spas was over and we were headed back to the Magni, and our last evening of our Viking Grand European Tour. 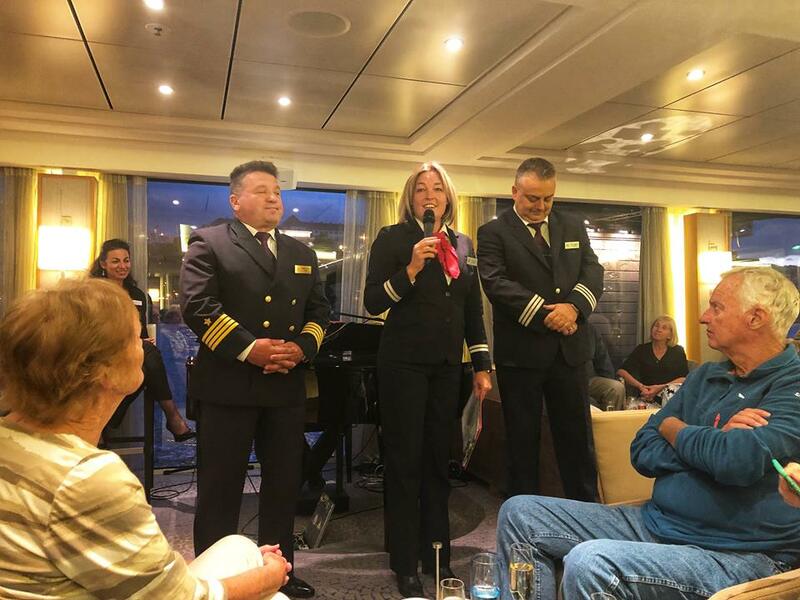 The final farewell from Tessa, our program director all 15 days of the Viking Grand European Tour river cruise, and Magni Captain Mykola and Hotel Manager Peter. Since no money changed hands on board the Viking Baldur and the Viking Magni during the course of our fifteen day Viking Grand European Tour, this was the evening to settle up our onboard account. The reception desk was staffed from 6:00 to 11:00 for this purpose. The Captain’s Cocktail Party was festive with laughing, hugging, and tears. 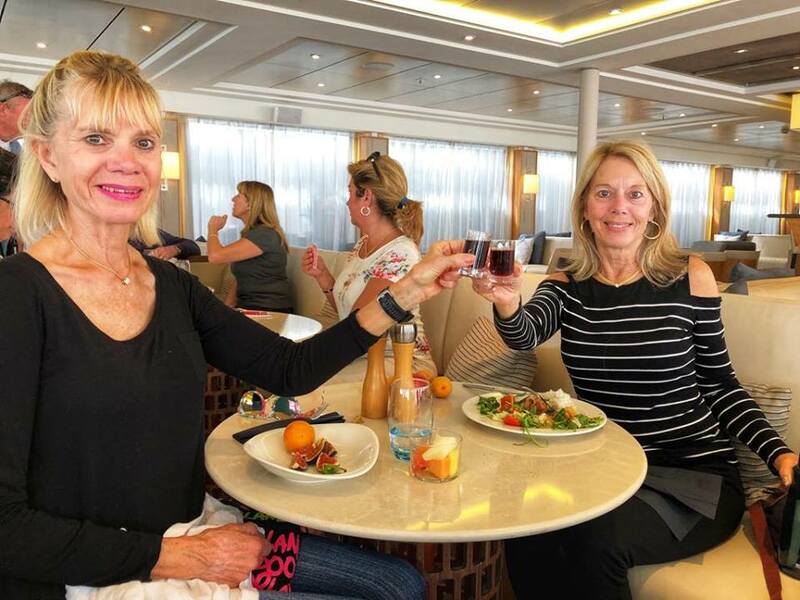 We had a final farewell toast celebrating our journey with Viking, all the new friendships that were formed and the memories-of-a-lifetime that were made. The final farewell was given by Tessa, our program director for the entirety of the 15 day Viking Grand European Tour. She was our organizer, our leader. She was always around whenever and wherever we needed her. If someone was having a problem or difficulty, she was always there. She made the trip! Thank you, Tessa, for an unbelievable and outstanding job as program director on our Viking Grand European Tour! 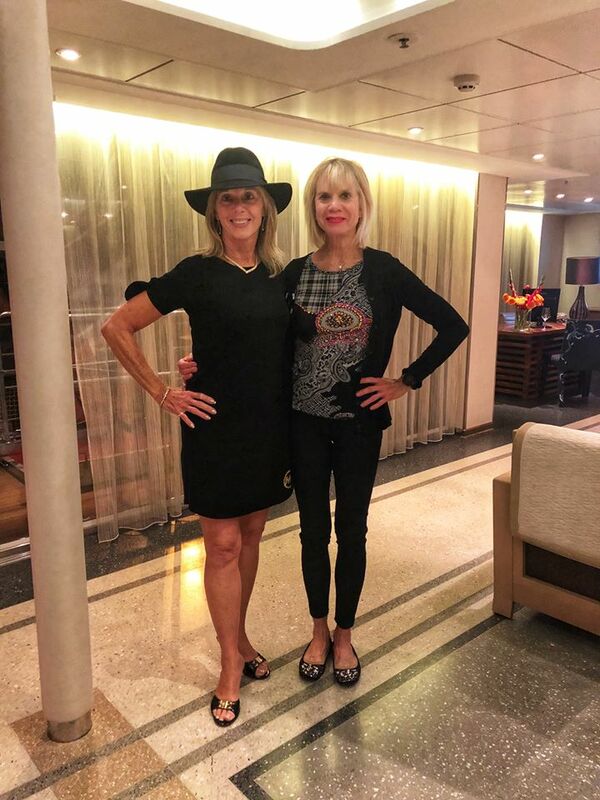 After our last dinner on the river cruise, we spent our final evening dancing in the lounge and saying goodbye to all of our friends. And then to packing for our trip back home…. 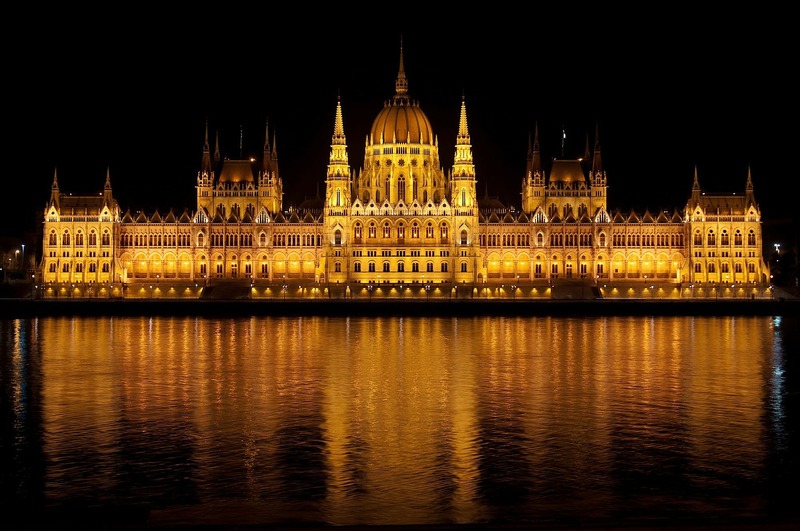 Hungarian Parliament in all her splendor! Viking had arranged Robyne’s and my transportation to the Budapest Airport as part of their services before we left home for the trip. The staff of the Magni had published departure information yesterday for all guests. My sister and I were instructed to leave our luggage outside of our stateroom door by 7:00 AM. Since all passengers were leaving at all sorts of times throughout the night and early morning, breakfasts at the coffee stations and the Aquavit Terrace began at 2:30 AM. Breakfast in the main dining hall was from 6 – 9:00 AM. A new group of passengers would be arriving by 11:00 AM this morning and the staff needed to prepare the ship. All passengers from OUR Viking Grand European Tour were required to be off the ship by 9:00 AM. We went into the main dining hall for a warm breakfast and were ready to leave by the appointed 8:15 AM time. There was a full motorcoach of fellow passengers departing with us to the airport. All of our luggage had been transported from the ship to the coach and was lined up in numerical order, according to our room numbers, and we were responsible to verify each piece of luggage we brought with us was present. Then it was loaded up in the coach and we boarded. There was one final bittersweet farewell to Tessa, and we were off. The airport was about 30 minutes away, and the passenger drop off where we pulled up was extremely busy. Robyne and my luggage was unloaded quickly, and instead of staying with the group and the Viking rep we decided to get a head start and go inside the terminal ourselves. Once inside it was an overwhelming madhouse with people and luggage everywhere, every which way. Realizing our mistake we rejoined the group and the Viking representative expertly directed us to the proper check-in location. Lesson learned! After this, we were on our own and our Viking Grand European Tour river cruise had come to its official end. 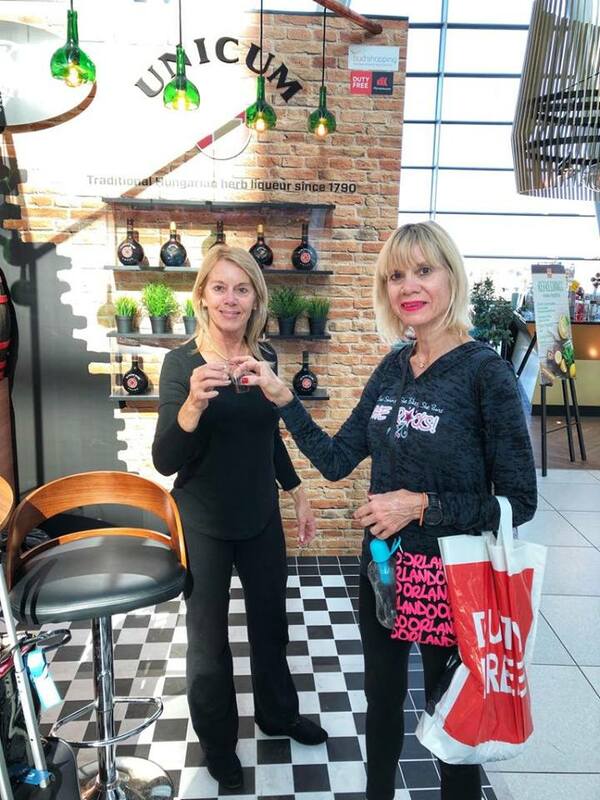 Robyne and I gate side at the Budapest Ferenc Liszt International Airport giving the Hungarian herb liqueur Unicum a try. When on a Viking Grand European River Cruise, there’s always an adventure waiting to happen. Have you ever been on a Viking river cruise? What is your favorite memory? Please share with us in the comment section below. Do you have any questions regarding a Viking European river cruise? Please ask away in the comment section below. 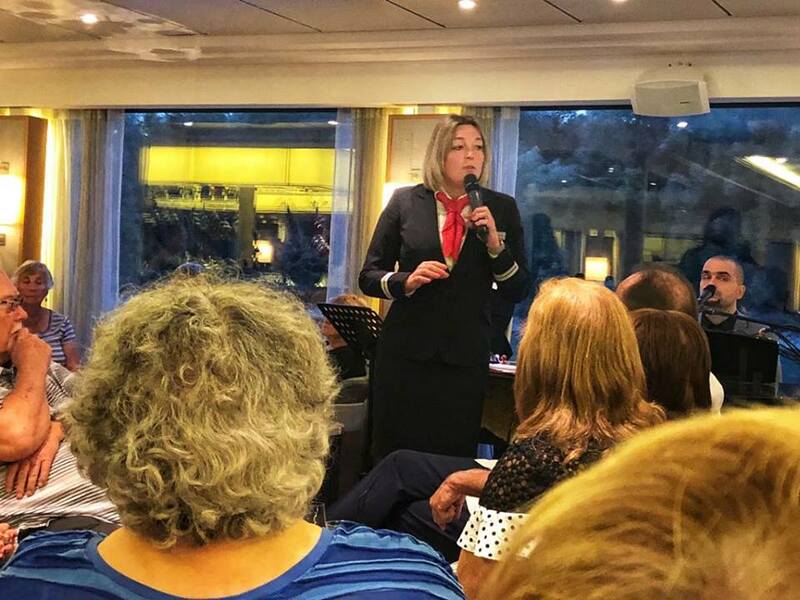 Please note: I was provided a complimentary Viking Grand European Tour river cruise for myself and a guest, and a stipend, as an opportunity through Viking Cruises for the purpose of this honest review. All opinions are my own unless otherwise noted. Looks amazing! What were the dates of your trip?